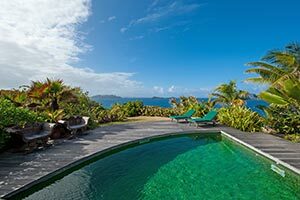 Villa UJV 337, which is also referred to as Villa Atalante, is a lovely 1 bedroom villa in a desirable area of Pointe Milou, St Barts. Perfect for a honeymoon, this villa has beautiful ocean views and sunsets. This villa is completely open, and it features an outdoor kitchenette, outdoor dining area and an open, yet covered, living area which lies behind the sunning deck and sapphire pool.